Luigi Boccherini’s Sonata G17 in C Major was being published in honor of The Silva Centennial Celebration presented by the University of North Carolina at Greensboro in 1994. Luigi Silva had planned to publish 26 violoncello sonatas by Boccherini, but due to Mr. Silva’s untimely death, the project was never completed. Sonata G17 was one of the 26 sonatas included in those plans. Luigi Silva used three manuscript sources for his edition. Two are from the Fondo Noseda Collection in the library of the Milan Conservatory (Noseda E 24-26, Autograph; Noseda E 24-30, Contemporary Copy) and the third can be found in the library at the Conservatory of Florence (Firenze FV 320, Contemporary Copy). Luigi Silva’s manuscripts of Sonata G17 reveal a completed cello part and realized keyboard part. He edited the exposition of the first movement of the solo cello part with fingerings and bowings. The rest of the movement was recently edited using the ideas and principles that Silva employed in the exposition. The dynamics and tempo markings in the solo cello part come from Silva’s keyboard part. His keyboard realization, from Boccherini’s bass accompaniment, is extremely tasteful. It supports and enhances the solo cello’s lyrical and virtuosic quality. Boccherini composed all of his violoncello sonatas for violoncello solo and ‘basso,’ or bass accompaniment. 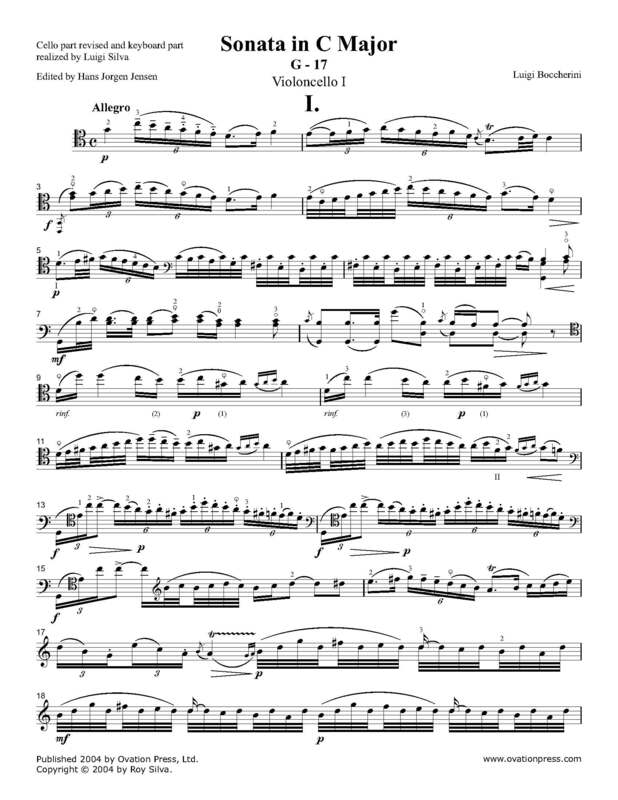 It is thought that the accompaniment was written for a second cello, but could have been played on a variety of instruments including double bass or lute.